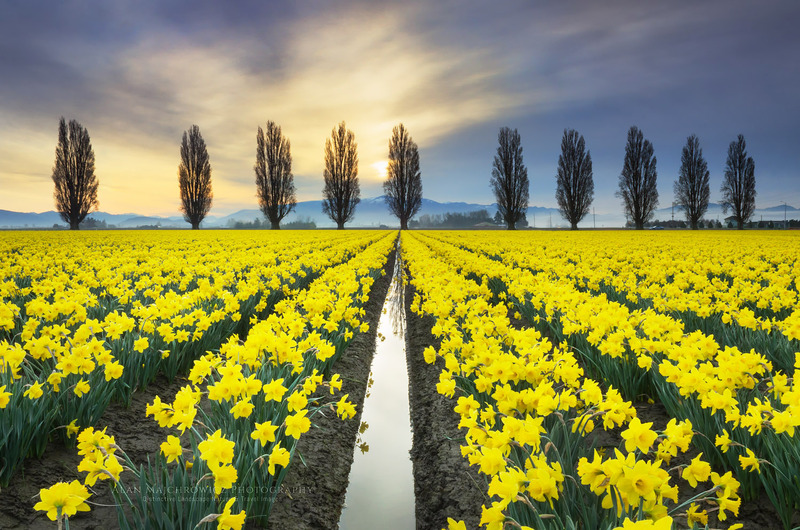 One of my spring rituals is to make a trip down to the Skagit Valley to photograph the Daffodil and tulip fields. After months of grey rainy weather it’s always a treat to see such bursts of color. From the end of March though the first week or so of April daffodils are the star attraction. Depending on the weather, tulips begin to bloom around the second week of April. Of course the fields also make great subjects for photography. Since the fields change location every year it’s worth scouting out in advance where the best compositions may be. Photographing daffodils can be more difficult than photographing tulips. Mostly this is due to the fact that daffodils bloom earlier in the season. In late March the weather is still winter-like with rain and cold winds. 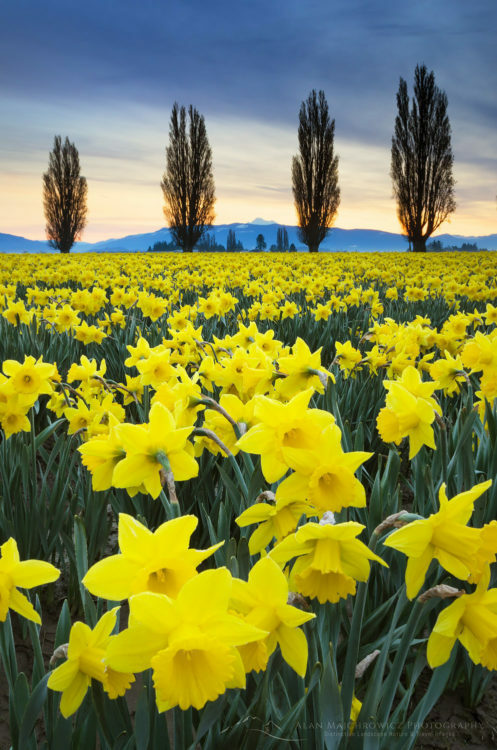 Daffodil blossoms stand higher and on thinner stalks than tulips, so they move easily in the slightest of breezes. Meaning if you’re lucky enough to have good light you may be hampered by windy conditions. 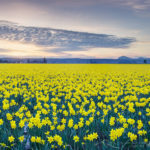 If there is a breeze present you may need to resort to techniques such as focus stacking to achieve the necessary depth of field while using a faster shutter speed. Photographing in lower light conditions will only compound these issues. Of course it should go without saying that a good tripod is a necessity here. Another very helpful item I’m never without is a remote to trip the shutter while the mirror is locked up. Photographers know that it pays to get up before dawn in order to take advantage of blue hour and sunrise light. 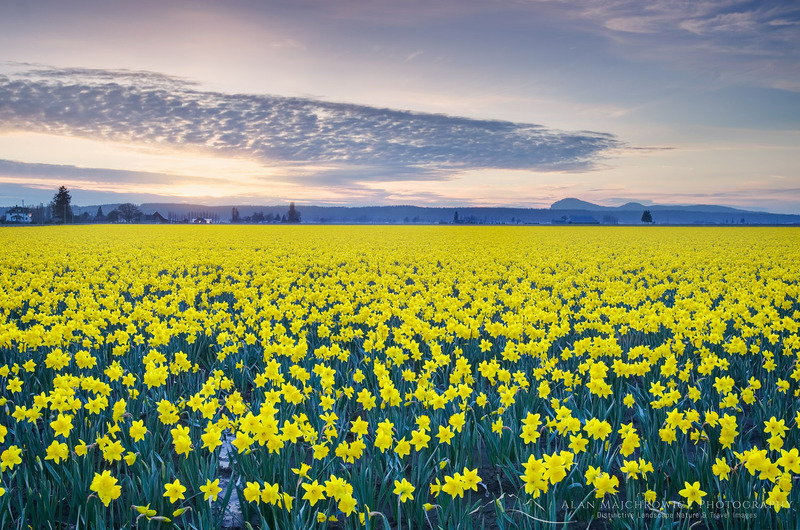 Here in the Skagit Valley, another good reason to arrive early is to beat the crowds. On a sunny weekend the roads will be gridlocked like Seattle on a Friday afternoon. At the height of the bloom it may seem like everyone on the entire West Coast is here to get a photo of their loved ones in the tulip fields! So go early, and preferably on a weekday. 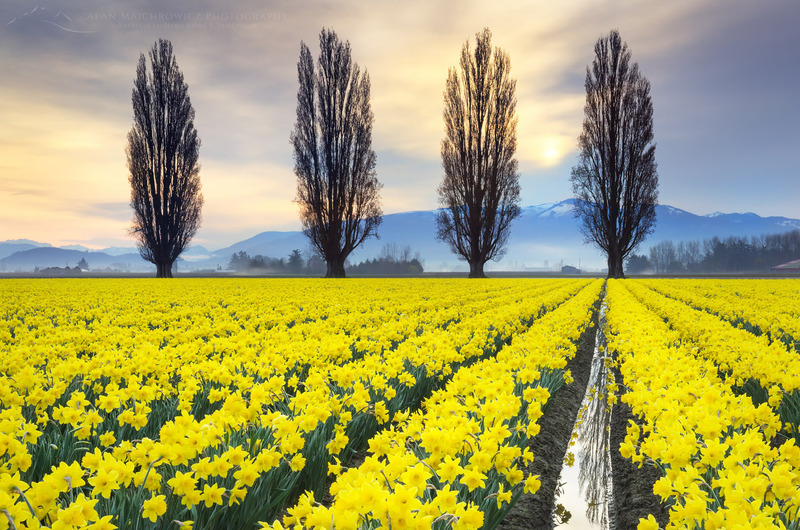 Aside from photographing Skagit Valley daffodil fields and tulips, the lower Skagit Valley also boasts some other worthwhile attractions. 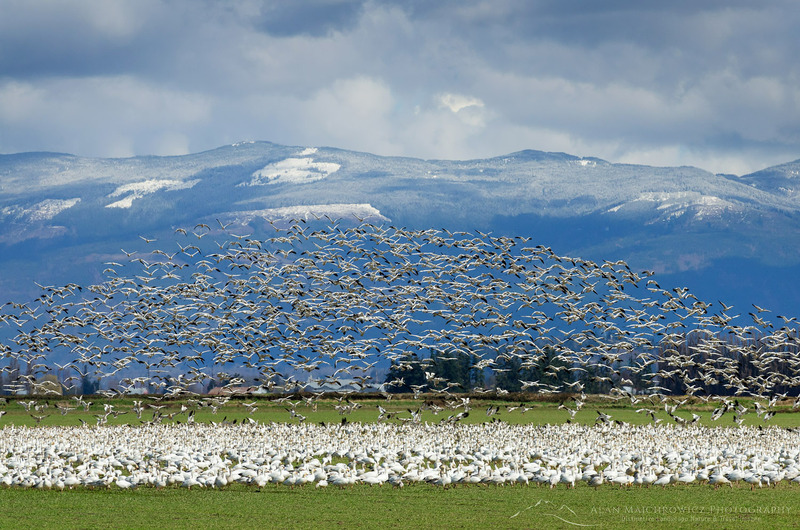 Foremost among these are the snow geese and trumpeter swans. Every winter through early spring these beautiful white birds come to the fields to rest and feed before resuming their long journey north. They move among the fields every day, so it can be a challenge to photograph them in the best location. If you plan on photographing these birds please refrain from alarming them. 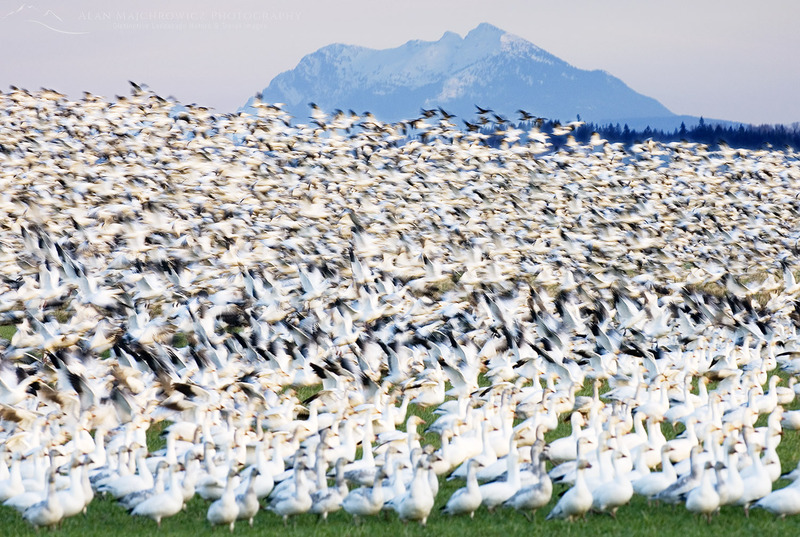 While it’s a magnificent sight to see an entire flock in flight, it also cause undo stress on them. Finally, visit to the Skagit Valley wouldn’t be complete without stopping by LaConner, a self-described artist enclave and boater’s paradise. Aside from browsing the quaint shops and having a bite to eat, photographers can come away with some great travel photos from this picturesque town. Hint, photograph the red bridge and sailboats in evening light!